Best hidden windows 10 features with tips and tricks give you surprise! Now that windows 10 features are out and millions of people are already running it, let’s take a look at some of the best hidden windows 10 features, tips, and tricks in the operating system. If you’re still on the fence, take note: You really do want Windows 10, despite a lot of the gripes we’ve shared over the past several months. It’s worth getting on the list for (or downloading the Windows 10 ISO directly). It combines the best of Windows 8 — super-fast startup, improved security — with much of what made Windows 7 familiar and easy to use, and without trying to force you to buy a touch screen or learn a whole set of hidden UI gestures. And if you’re a computer nut like me, tweaking the OS is always the fun part. Discovering and implementing power user tips are my favorite part of getting a major new version of an OS. I still remember back when DOS 5.0 came out, and I was running DOS 3.3, and I got to try all these new things to optimize my 286. (We’ve come a long way.) Nostalgia aside, here’s what you need to know to amp up your Windows 10 install and take it to the next level. One of the best things about Windows 10 features are how it handles virtual desktops. The fact that it finally handles them at all, out of the box, is a great step, since Mac OS X and Linux users have had that capability for a long time. It lets you set up a series of tasks and windows on your desktop, your email and Twitter window on another, and a third for general Web browsing and research. When you’re first setting up Windows 10 features, make sure to select a Custom install so you can modify the privacy settings, instead of going with the Express install. (If you already installed it, no worries; you can fix it all in Settings). Otherwise you’ll find yourself agreeing to all sorts of private data sharing — and while Windows 10 is free for Windows 7 and Windows 8 users, it’s not a free product in and of itself — so there’s no reason to share your personal information when it’s not required. You can finally print a document (or rather, save it) as PDF without using a third-party utility. This makes it much easier to save and distribute documents that aren’t easily modified. Another long overdue feature makes it in under the radar. You may feel differently about this, but I certainly don’t like the idea of allowing access to my WiFi network unless I specifically give out the password. Here’s how to make sure your computer isn’t doing that — and if it is, how to turn it off. If you’re thinking of taking the Windows 10 plunge, but don’t want to disturb your machine that’s currently running just fine, here’s how to install Windows 10 in a virtual machine first. Note that this is different than the virtual desktops I mentioned above; it’s virtualizing the entire OS within another OS (your existing one). Windows Explorer windows are a lot more useful this time around, thanks to a new Home tab. It makes file copies a cinch. If you look at the top left of the window, you’ll see a new Quick Access group that lets you navigate to recently accessed folders. That makes it much easier to maintain a fast workflow as you navigate around your computer’s file system. The new Start Menu is such a huge improvement over what came with Windows 8.1 that it’s almost impossible to describe the relief. It combines the best elements of Windows 7 and Windows 8. And it’s also fully customizable. I admit the first thing I did is unpin all of Microsoft’s tiles and then shrink the size of the menu so it looks a lot like Windows 7. For a while, during some of the Windows 10 Technical Preview builds, you could pin the Recycle Bin to the taskbar, which makes it a bit more like OS X. Unfortunately, that functionality seems to be gone in the release version, though you can still pin it to the Start Menu as a tile. A lot of Windows 10 utilities underneath the service still look the same as they did in Windows 7 and Windows 8. But one of the hidden tweaks is in the Command Prompt — head over to Properties and you’ll suddenly find you can enable a host of customizations, including a transparent background, resizing the window, and word wrap. If you’re on a laptop and your battery is running low, windows 10 features is smart enough to begin throttling back background services and other threads so that you can squeeze the last bit of battery life out of your machine. To enable Battery Saver, click the Start menu, and head to Settings | System | Battery Saver. Ever notice how when you hover your mouse cursor over a window and try and scroll, you still can’t, because the window wasn’t active? Turn this feature on in Settings | Devices | Mouse and Touchpad and you’ll be able to do just that. Free cloud storage is a godsend these days, and Microsoft makes it super easy in windows 10 features with OneDrive. You can use it to store files for mobile device access from iOS or Android, and you can even set it to let you access any file on your PC remotely — not just the ones you drag over to your OneDrive folder. Windows 10 finally shows some real Xbox integration, and you can use it to log into your Xbox Live account. But more importantly, you can use it to stream Xbox One games locally on your PC. You’ll have to enable it first on the Xbox One under Settings | Preferences | Allow game streaming, and then on the PC in the Xbox application. The new Settings panel is easy to navigate and makes more sense than the crufty old Control Panel, but you’ll still need the latter to access some deeper options in the system. It’s easy to call up, even though it’s hidden; just right click on the Start button on the bottom left of the screen and choose it from the pop-up menu, or type Control Panel in the Search bar at the bottom left in the taskbar. When you right-click the Start button, you’ll see all kinds of useful things there, such as Computer Management and Disk Management; for what it’s worth, those options bring you right back to the familiar Windows 7-style apps in each case. 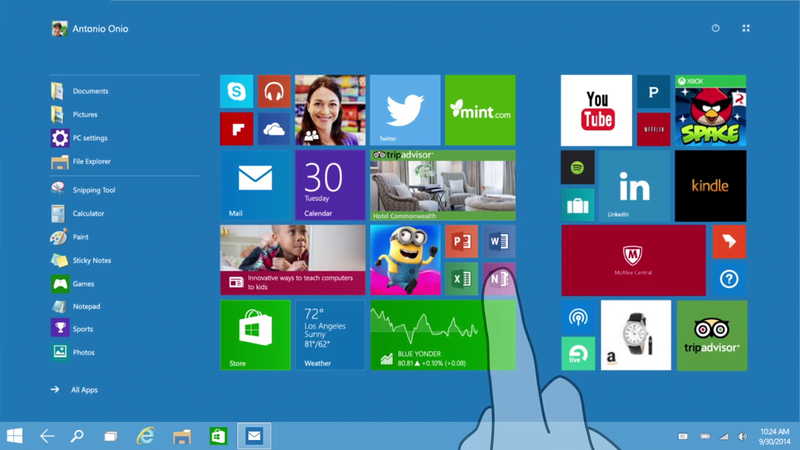 Know more about Microsoft Windows 10,…..
How to windows 10 download Free now. Best Video Editing Software for Windows for Making Memories More Beautifully. The 10 Free Photoshop Alternatives Windows and MAC. WhatsApp Desktop App Download For Windows And MAC. Best 10 secrete WhatsApp tricks that give you a chill ones.